Brushing up on our bilingual skills in Russell, Neepawa and Winnipeg while camping lakeside in Sandy Bay, Manitoba. Oh, AND officially crossing the Longitudinal Centre of Canada! 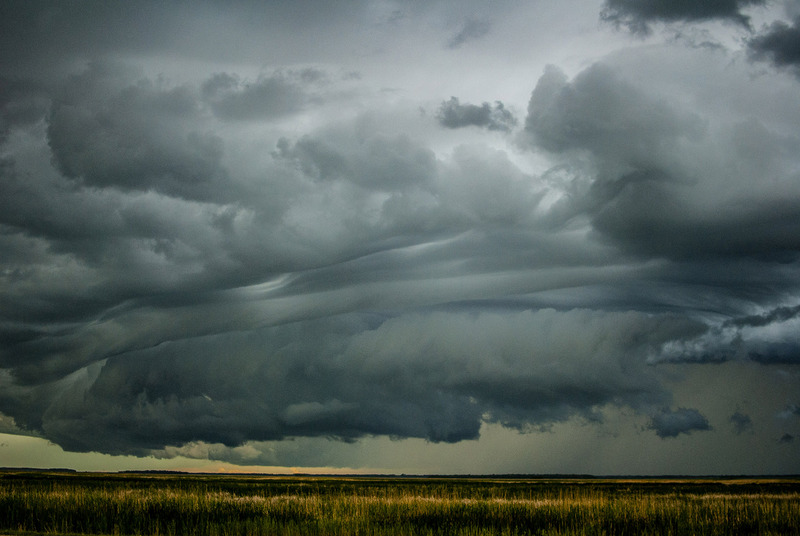 Manitoba is the final prairie province we’d pass through before returning to Ontario. 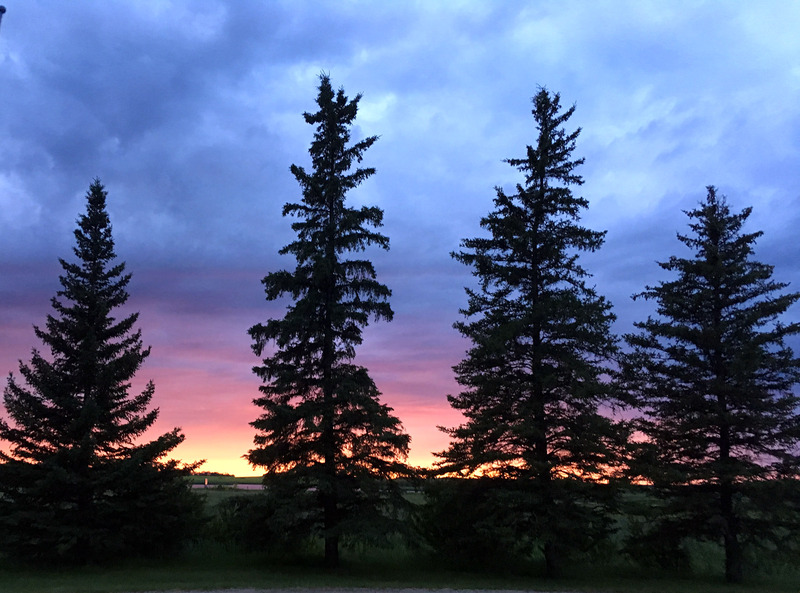 MB and Saskatchewan often get deemed the most boring provinces to drive through because, well, prairies…but they’ve actually got a lot more going on than your average wheat fields. Our first stop was not far from the western provincial line in a small town called Russell. We were sold on this town when we found out it had a park with FREE electrical hookups! We’ve only experienced this once before in Oklahoma and even though we have solar, it felt like such a luxury. It was particularly helpful this time around because the weather was total garbage and the grey, brooding skies weren’t doing much to keep our battery charged. The park was a nice grassy area with vault toilets, a water pump and lots of prairie dogs for neighbours. It just so happened to be the start of the Canada Day long weekend so the crappy weather wasn’t exactly ideal but we still couldn’t complain that we had a nice quiet spot to relax for a couple days. Not long after we crossed into Manitoba, we were reminded how prominent the francophone community is in the province. For Americans that ought to be pretty strange to have all the signs written in two languages while struggling to give directions with street names in a not so native tongue. Personally, I went to French school my whole life and still get confused sometimes so Manitoba definitely kept us on our toes. 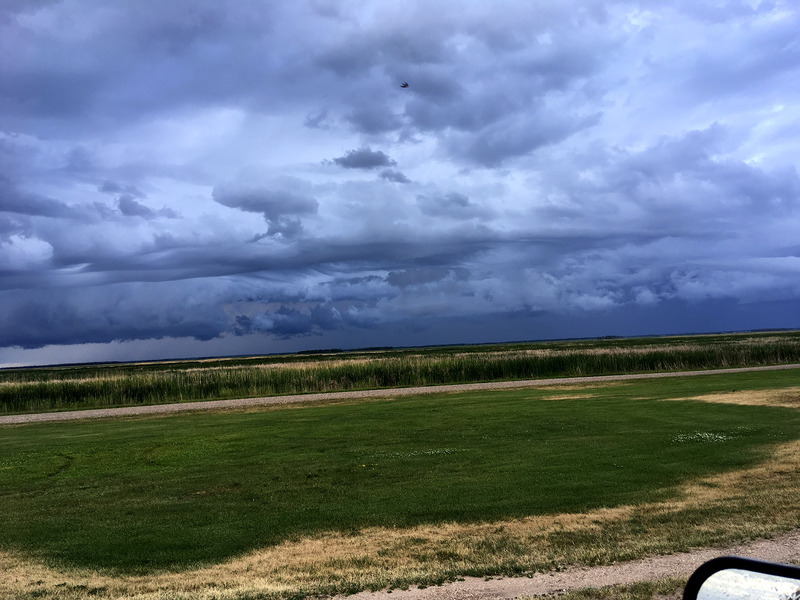 Once Canada Day hit, we decided to make our way to a different spot for a change of scenery and with the naïve ambition that moving further east may help us to avoid the storm that was looming over our heads. We left Russell knowing that a severe thunderstorm was in the works so we had to boogie if we were going to stay on the edge of it. Within about an hour and a half, reality hit and we got soaked – shocker. We drove slow and attentively followed our Google Maps directions when we realized we were going to be on dirt roads for the next while without hitting a town for a solid hour. Normally that wouldn’t be a big deal but that was also when we realized we barely had any gas. So to paint a picture, it was teaming rain, we were maintaining a pace slightly swifter than a snail and were just hoping that even in the 80s, they’d give these rigs somewhat of a reserve below the empty gauge. We decided to reroute and go a bit off track in hopes of making it to Neepawa to gas up before not being able to make it any further. It was a tense drive once we got back onto the paved highway and each km we drove felt like a relief in my mind while imagining having to hitchhike to the gas station with a jerry can. After a half hour detour, we reached Neepawa where the clouds seemed to clear, the sun popped out and the energy instantly switched gears. We got gas, ate a bag of roast chicken flavoured Lays and FaceTimed family and friends to say Happy Canada Day. 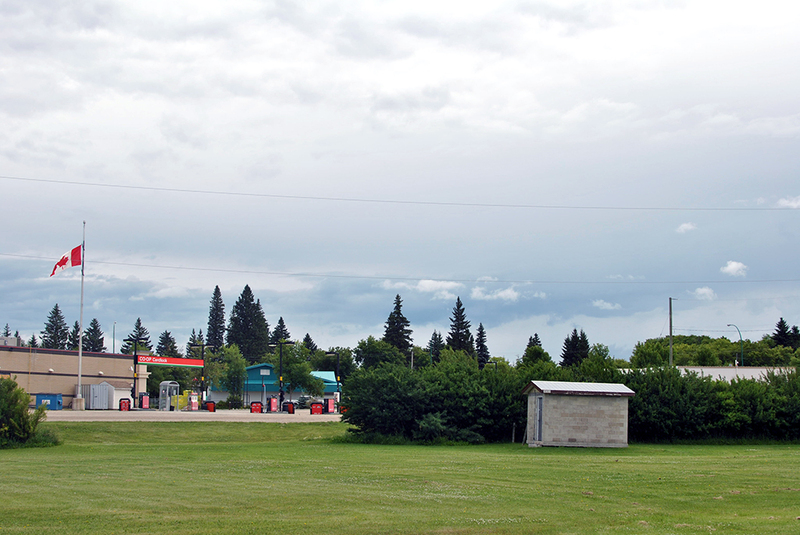 Neepawa was like an oasis in the desert and it immediately changed our mood. It’s a cute little town with great energy and super friendly people that made us excited again to be heading to a beach that we could camp on in Sandy Bay. The roads were drying up and even though I could see the water on my map, it was hard to believe these desolate farmlands would open up to a beach anytime soon. But, like a beacon of light, we saw a couple of RVs parked right along the sand and knew we made a good decision heading this way. There were a decent amount of folks there but it was far from crowded since the stretch of shoreline is fairly long and everyone had their own little zone. Despite storm clouds starting to build again, kids were swimming and people were outside drinking Molson branded beverages and eating poutine – ok, slight exaggeration but it was Canada Day. 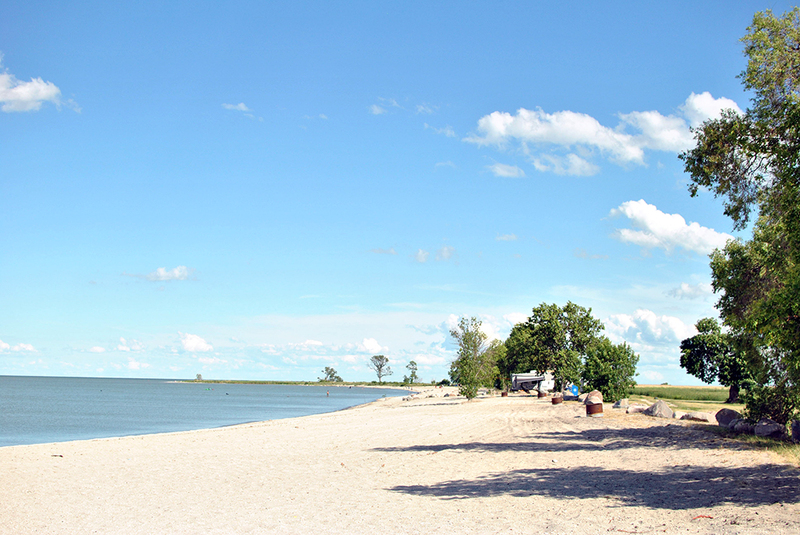 Anyway, the place is (somewhat comically) called Hollywood Beach and is right on the western shore of Lake Manitoba, about an hour northeast of Neepawa. Beachside camping certainly isn’t the first thing to come to mind when thinking of a prairie province but just like Little Manitou Lake in Saskatchewan, we were pleasantly surprised. The beach even had outhouses, which always come in handy even though these ones could have used a power wash…or two. Who woulda thunk this would be in Manitoba!? Hollywood Beach was a great time. Before the rain hit again, a family further down set off some fireworks and it started to feel like a celebration. Unfortunately, within a few minutes, everyone got rained out and the fireworks were swapped out for lightning but it still lit up the sky in either case. The holiday Monday was a really lovely, sunny day and a bunch more people came out to play in the water and relax on the beach. The water was nice and warm and didn’t get deep until we were way out there which was helpful for an overdue wash (#vanlife, lol). There were, however, an absolutely insane amount of bugs. Mosquitoes, gnats and these tiny little green bugs that managed to come in through our screens and doors and made a home for themselves in the van. They almost looked like little baby sea monkeys that were essentially squatting in our home so had no choice but to vacuum them up until we could breathe again. Sorry (not really) if you’re one of those people that refuses to kill bugs but these were just out of control. On our final eve at the beach, a car pulled up to the van as we were eating dinner and wanted to make sure that we weren’t broken down or anything since we have an out of province plate. I’m used to the city where people are very often up to no good but this local farmer was genuinely just making sure we were ok and enjoying the beach – that “friendly” claim on Manitoba’s license plates really checks out. We got up early the next morning and set out for The Peg where we’d visit some family and indulge in a proper shower. Winnipeg is actually a cooler city than I was expecting and had a lot of character with old buildings and distinct neighbourhoods. We walked around Osborne Village and The Exchange before scoping out The Forks and its adjacent Market along the Red River. 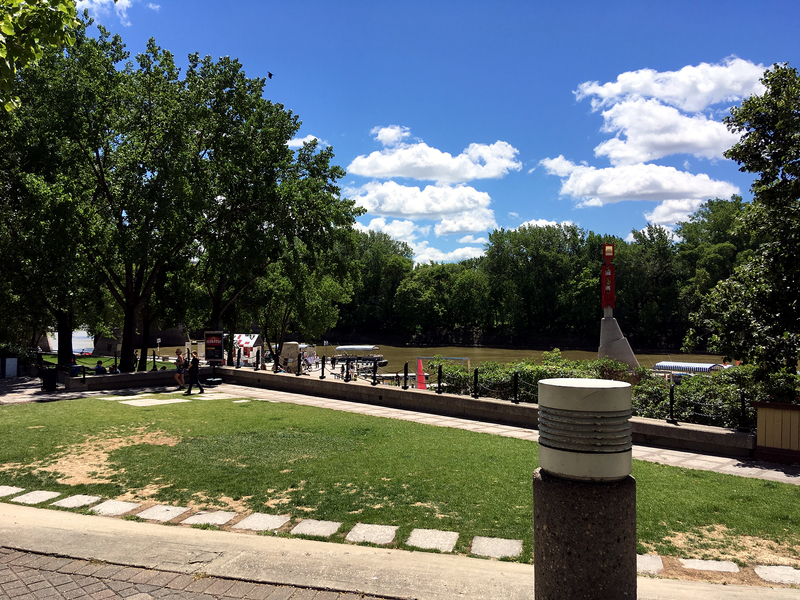 We lucked out with a clear sunny day and really enjoyed the big city vibe that Winnipeg had going on despite not being all that big (in comparison to say, Calgary). We had a really nice visit with Justin’s cousin’s family and spent the night there before anxiously setting out to my (Olivia) home province of Ontario. Although it hardly felt like I was going home per se since Northern Ontario and Southern Ontario are basically different provinces. 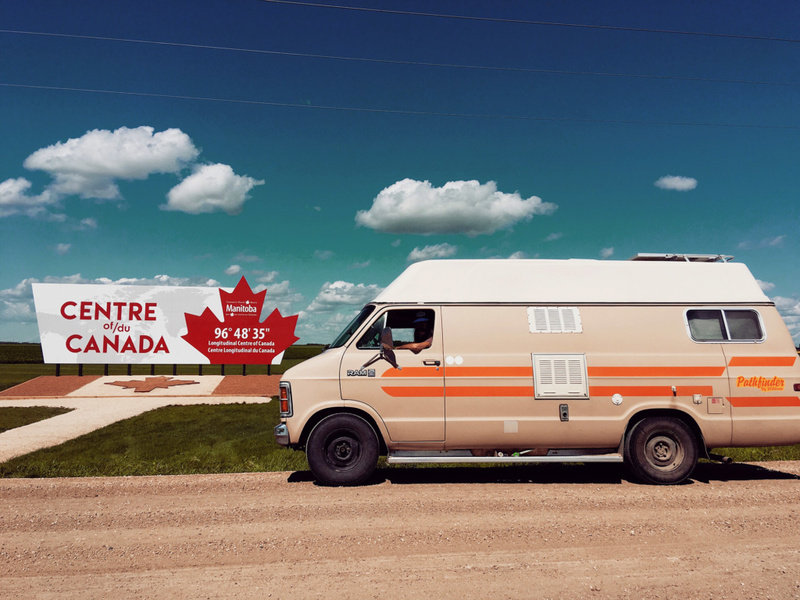 Anyway, not long after leaving Winnipeg, we hit a pretty cool landmark: the Longitudinal Centre of Canada. This marked our halfway point between Vancouver Island and Newfoundland and reminded us that we still had a long journey ahead with lots more to see. It also confused us greatly because there is an exit off the highway with a sign that says “Landmark” that we thought would get us to the landmark itself but it actually just leads to a small town called Landmark. Haha, Manitoba was definitely full of great surprises.